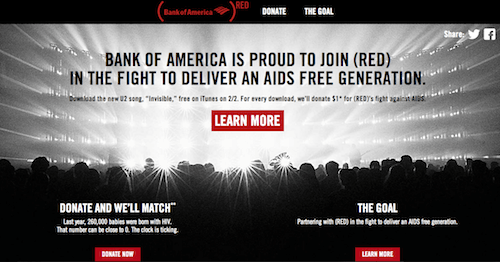 Kicking off with a Super Bowl commercial, (RED), U2 and Bank of America have formed a new partnership that will generate more than $10 million to fight AIDS. In the commercial, U2 will perform a new song which will be available as limited download on iTunes for the 24 hours following the Super Bowl. For every download, Bank of America will donate $1, up to $2 million to the Global Fund to Fight AIDS, Tuberculosis and Malaria. BofA’s commitment also resulted in the Gates Foundation, SAP and Africa’s Motsepe Family matching for a total of $22 million. Cause will continue to play center stage at this year’s Super Bowl advertising extravaganza. This campaign is a no-brainer for viewers everywhere: a free, limited time download of a new U2 song premiered via the Super Bowl ad. A $1 donation on top of the free song. It’s a big stage on which to launch a big cause initiative for BofA. Somehow, the excess of a Super Bowl ad spend is more easily justified when a cause is involved, particularly if the message is win/win/win for consumer, cause and brand.